Ultra-quiet high performance for noise sensitive environments. Rear Slide Out Paper Drawer- A full box of printed forms can be heavy. The easy-to-slide Rear Slide Out Paper Drawer with lifting handles makes form collection easier and safer for your users. 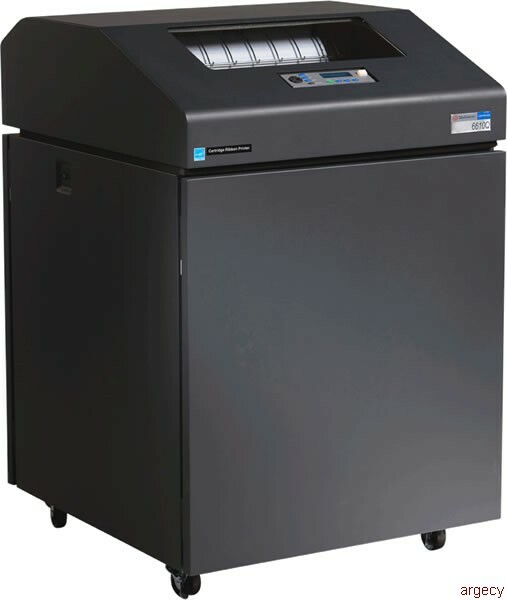 The front paper access option enables you to load forms and retrieve printed output from the front of the 6600Q cabinet. This option allows you to better utilize office space by placing the printer against a wall. Use the SureStack Power Stacker option to neatly fold your forms. Some forms that do to not refold well or tend to fluff up during printing may not stack properly with the passive stacking aids found in the standard quiet cabinet models. For these applications, a SureStak power stacker option is available. This device actually pulls the printed paper over the top of the print path and pushes it down into the stacking area. There, a series of paddle wheels actually refold the forms tightly, so even the toughest forms can be printed and stacked neatly up to a full box. Extended Forms Support - The 6600Q cabinet can be equipped with extended doors to accommodate larger forms. A single extended door will support forms up to 14" and two doors will allow up to 17". Cartridge Ribbon Family -Selection of cartridges available to match customer's print volume and budget requirements.